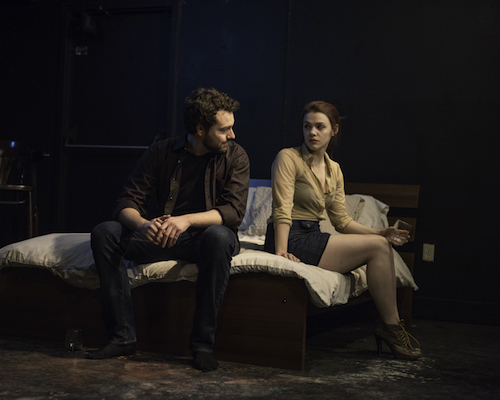 If a play’s purpose is to offer a take on a specific subject, I’m expecting a nuanced perspective to run through its core, and that is certainly the case with Homewrecker. Currently running at The Assembly Theatre, the story centres on a cheating, self-loathing divorcee named Craig (Blue Bigwood-Mallin) eager to figure out where he went wrong, and Veronica (Susannah Mackay), the woman he cheated with, whose steely resolve he needs to put himself back together. Craig’s basement apartment—uncanny in its execution by set designer Chris Bretecher—sets a believable backdrop for the play’s extravagant central conceit: Craig’s $5000 offer to Veronica for a night’s company to prove to himself that he’s able to avoid seducing her again and is thus not the deviant sexual animal he thinks he is. Playwright Daniel Pagett deftly uses Craig’s offer as a springboard to probe the tenuous nature of trust, the fictions that sustain us, and the complexities of loving someone you don’t like, all through a handful of jaw-dropping twists that continually replenish the play with fresh life. As the self-ruminations deepen and the conversations grow increasingly heated, the actors’ supercharged performances make it enjoyably difficult to distrust anything they say. With the help of loaded, stylized blocking from director Anne Van Leeuwen, Pagett teases out buried feelings through images and ideas that are unrelenting in their humor and specificity. He is a poet with the gift of wit and bestows his characters with a strong sense of emotional awareness such that they are able to laugh at their problems. Pagett has fun with Craig and Veronica’s deep-seated sense of vulnerability as weakness and indulges in it without reservation. He acknowledges the audience’s presence by continually pulling the rug from under their sense of his characters’ identities. Bigwood-Mallin layers Craig with hardness and world-weariness as the play progresses, such that the self-conscious mope we meet at the beginning feels like a limited facet of the conniving man we meet later on. His emotional range and control made me flip-flop on my feelings about him at least three times and appreciate how easily an embodied performance can sway. This is riveting stuff. The same goes for Mackay, whose performance is authoritative and dialed-in to what’s happening in front of her, as if there were nothing else going on in the world. Veronica’s focus is that of someone possessed by the fortuitousness of the situation she finds herself in. She is the perfect sassy foil to Craig’s uncertain sulk, exuding the kind of piercing confidence he is looking to integrate into his newfound singledom. The connection between these two is magnetic from the start, feeding off each other’s energy to imbue Pagett’s rapid-fire dialogue with explosively felt authenticity. They are masters of transformation, going from guarded strangers to confidants and back with a commitment that feels like close-up magic in the venue’s cozy space. The plot twists were by far the highlight for my guest, Erika, who found them to be high stakes without interrupting the narrative flow. In spite of adultery being familiar dramatic territory, she says, the play takes a common story and elevates it into a tantalizing entertainment and immersive character study. One that lays out rather thoroughly the many ways in which we try and fail to control who we love. Homewrecker is on all my counts a superb piece of theatre that should not be slept on. The combination of a script with conceptual rigour where every line is considered and performers willing to suffer through their characters’ growth makes for a captivating night out to say the least. Homewrecker is playing at The Assembly Theatre (1479 Queen Street West) through March 10, 2018. Shows run Tuesday-Saturday at 8:00 pm. Tickets are $20 for general admission and $15 for arts workers. I very much enjoyed your review.